The Yahoo! Accessibility Lab created a fun project this year which gives a guide dog the ability to photograph her perspective of the world. Pecan is the guide dog for Lucy Greco, who runs the accessibility center for UC Berkeley. The project started at the CSUN conference earlier this year. This is the biggest conference for assistive technology and education. Pecan became the star of the show as everyone wanted to see the budding photographer. Pecan, Lucy, and the Yahoo! Accessibility Lab recently visited the Ed Roberts Campus in Berkeley. This center, conveniently attached to a BART station, provides a synergistic environment for organizations that improve the lives of the disabled. Enjoy the photographs as Pecan guides Lucy around this impressive center. Pecan uses a Nokia phone that uploads the geolocated images to a server. This server provides some basic image manipulation and submits the images to Flickr, a photo sharing site from Yahoo. You know it is Thanksgiving time when the smell of these liver cookies fills the air at Alcala. We’ve been making batches of these goodies for our guests for many years. In fact, we originally published this recipe on our Alcala Pet Care web site 10 years ago. Dogs absolutely love this recipe. What’s not to enjoy, you’ve got liver and garlic? You can vary the recipe by adding an egg, fresh garlic, different types of flour, etc. Feel free to play with the recipe. Your dog will love anything with that much liver. Preheat oven to 350 degrees. Liquefy liver in blender, do not use a hand-held blender stick. I made that mistake and burned out the motor. Add dry ingredients to the liver. Grease cookie sheet. Drop teaspoonfuls of mixture onto cookie sheet and flatten with bottom of glass dipped in water and cornmeal. Alternatively, you can spread the liver mixture over an entire cookie pan and cut them into cubes after the sheet has cooled. Bake for 15-20 minutes. This makes a huge batch. The aroma is better for the dogs than company, so don’t cook them the day of a big party. You’ll want to keep the finished cookies in the refrigerator. 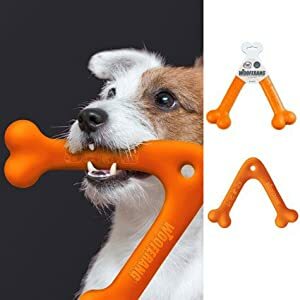 These are also great for training your dog. Dog shows are filled with people carrying liver treats in their coat pockets.